The Long March 6, China's latest version of the rocket it uses to carry payloads into space, was launched at 7:01 am Sunday from Shanxi Province in northern China, and took 20 micro-satellites into orbit for tests. China successfully launched its Long March 6 carrier rocket for the first time on Sunday morning, when it blasted off from the Taiyuan Satellite Launch Center in north China's Shanxi Province, taking 20 micro satellites into space for tests. "The new model will significantly improve our ability to access space," said Zhang Weidong, chief designer at the Shanghai Academy of Spaceflight Technology, part of the China Aerospace Science and Technology Corporation [CASC]. "We believe it will greatly boost the competitiveness of Chinese carrier rockets in the international market." Zhang explained that Sunday's launch of the Long March 6 was also an opportunity to experiment with new methods of launching and testing a carrier rocket. "Loading, testing and positioning were finished when the Long March 6 rocket was at a horizontal position, before it was lifted to an upright position for launching," he said. Alongside with the United States and Russia, China is the only nation that has landed on the moon’s surface. The Long March 6 carrier rocket is 29 meters long and weighs 103 metric tons at lift-off. It has a payload of 1,080 kilograms and is designed to carry out small-load launch missions, such as micro-satellites, in a sun-synchronous orbit up to 700 kilometers above the Earth. Instead of using nitrogen tetroxide propellant, the rocket is China's first to use liquid propellant made of liquid oxygen and kerosene, which causes less pollution. "Using such propellant can cut costs by a great margin," explained Gao Xinhui from CASC, where aerospace engineers will next turn their attention to the launch of the Long March 11 carrier rocket, which will take three satellites into space on September 25. China launched its first Long March rocket in April 1970, and since then has carried out 210 space missions using the rocket series. In 2011 the country outlined its five-year plan for the development of its space exploration capabilities, laying the foundation for the building of a manned space station in low Earth orbit by 2020. The five-year mission will culminate next year with the launch of the Long March 5 and Long March 7 rockets, capable of carrying spacecraft bound for Mars or the Moon, or heavy loads such as cargo spaceships for the space station into low Earth orbit. BEIJING, September 25. /TASS/. China has successfully conducted debut launch of Long March-11 (Changzheng) carrier rocket, the country’s Central television reported on Friday. The launch took place from the Jiuquan cosmodrome in northwestern China’s Gansu province. The rocket carries four microsatellites. Long March-11 is a solid-fueled launch vehicle developed by the China Academy of Launch Vehicle Technology (CALT). The designers said the most powerful solid-rocket motor that is manufactured in China is installed on it. China recently conducted a flight test of a new missile capable of knocking out U.S. satellites as part of Beijing’s growing space warfare arsenal.The test of a Dong Neng-3 exo-atmospheric vehicle was carried out Oct. 30 from China’s Korla Missile Test Complex in western China, said two defense officials familiar with reports of the test. A Chinese press report also provided details of what was said to be a missile defense interceptor flight test carried out Nov. 1. 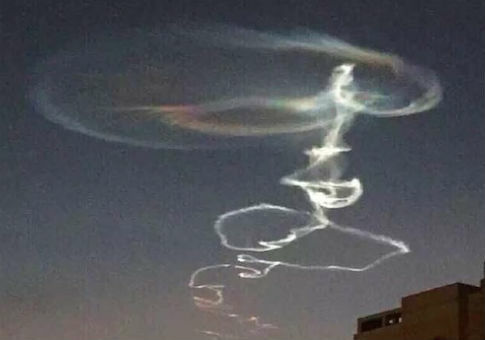 Photos of the missile’s contrails were posted online.However, the defense officials said the DN-3 is primarily a direct-ascent missile designed to ram into satellites and destroy them, even if intelligence assessments hold that the weapon has some missile defense capabilities. The DN-3 flight test was the eighth time China carried out an anti-satellite missile test. An earlier test occurred in July 2014, which China also asserted was a missile defense test. State Department and Pentagon officials declined to comment on the anti-satellite test.A Chinese Embassy spokesman said: “I don’t have detailed information about the missile test you mentioned.”“China advocates for the peaceful use of outer space, and opposes space weaponization or arms race in space,” the spokesman said in an email. A State official referred to a speech from February by Frank Rose, assistant secretary of State for arms control, verification and compliance, who commented on the 2014 test.“Despite China’s claims that this was not an ASAT [anti-satellite] test; let me assure you the United States has high confidence in its assessment, that the event was indeed an ASAT test,” Rose said. “The continued development and testing of destructive ASAT systems is both destabilizing and threatens the long-term security and sustainability of the outer space environment,” he added.China’s most disruptive ASAT test occurred in January 2007 when a direct ascent missile destroyed a Chinese weather satellite, creating tens of thousands of debris pieces that pose a continuing danger to both satellites and manned spacecraft, like the International Space Station. Rose said the secrecy surrounding China’s ASAT program is preventing any U.S. cooperation with Beijing on space. Cooperation will only possible after “China changes its behavior with regard to ASATs,” he said. Documents disclosed by Wikileaks revealed that the United States and Asian allies issued protests to China over a January 2010 flight test of an anti-satellite missile from an SC-19 rocket booster. It could not be learned if protests were lodged over the Oct. 30 test. Hong Kong’s Ming Pao then reported Nov. 4 that the test appear to be a “final-phase missile interception test had been conducted in the upper atmosphere.” “The capability to intercept was one of the capabilities of the PRC Hongqi-19 missile, and may be employed to intercept high supersonic gliding targets on the offensive,” Ming Pao stated. A forthcoming report by the congressional U.S.-China Economic and Security Review Commission contains an entire chapter on China’s military and civilian space capabilities.The report discusses two anti-satellite missiles, the SC-19 and the larger DN-2, which are meant to be fired in pre-determined flight paths as a satellite passes over Chinese territory.The report suggests that China disguised its anti-satellite tests in 2010, 2013, and 2014 as missile defense interceptor tests. It stated that each test involved a high-speed intercept of a mock warhead launched by a ballistic missile and not a satellite as a way to avoid debris. “Although China has called these tests ‘land-based missile interception tests,’ available evidence suggests they were indeed antisatellite tests,” the report said.The May 2013 DN-2 anti-satellite test involved “nearly geosynchronous orbit” where most intelligence and navigation satellites are located. The commission described that test as demonstrating “a new high-altitude anti-satellite capability” that could be deployed as early as 2020. The 2013 test, which reached 18,600 miles into space, was first reported by the Washington Free Beacon.Since 2005, China has conducted seven anti-satellite direct-ascent missile tests, according to the commission report. The report did not include the latest DN-3 test. U.S.-China Economic and Security Review Commission : “China is pursuing a broad and robust array of counterspace capabilities, which includes direct-ascent anti-satellite missiles, co-orbital anti-satellite systems, computer network operations, ground-based satellite jammers, and directed energy weapons,” the report said. Air Force Lt. Gen. John “Jay” Raymond, commander of the Joint Functional Component Command for Space, said at a House hearing in March that “we are quickly approaching the point where every satellite in every orbit can be threatened.”Rick Fisher, a military analyst with the International Assessment and Strategy Center, said if the DN-3 interceptor test is confirmed, “this is the first mention of the DN-3, apparently either a modified version of the DN-2 or a new anti-satellite weapon.”Fisher said the missile designated as the DN-1 was based on the SC-19 anti-satellite missile first tested in 2007, and that the DN-1’s booster appeared to be based on the KT-1 solid-fueled space launch vehicle, produced by China Aerospace Science and Industry Corporation. “It would follow that the DN-2 and DN-3 may also be [the corporation’s] products,” he said. China recently developed two new and more powerful space launchers called the KZ-1 and KZ-11.A DN-3 weapon based on the KZ-11 launcher would be capable of hitting targets at higher orbits.If the recent test involved missile defenses, “China may be developing [anti-ballistic missile] ABM systems capable of intercepts at much longer ranges than U.S. Ground-Based Interceptors based at Fort Greely in Alaska,” Fisher said. China has been harshly critical of U.S. missile defenses and has said it opposes all space weapons.However, the development of both missile defenses and anti-satellite missiles by China has been underway since the early 1990s, Fisher said. “The United States so far has not developed very high-altitude ASAT systems like the DN-2 and DN-3, also proving that China has little intention to follow the example of American restraint,” he said. On the possible future use of military force in space, Hyten bluntly said: “That’s why we have a military … I’m not NASA.”Defense Secretary Ash Carter told sailors aboard the aircraft carrier USS Roosevelt last week that the Pentagon is closely watching Chinese weapons developments. “And so, we see them building a system that’s new, we make sure we have countermeasures to that and actually, we’re making new substantial investments, new investments,” he said, noting electronic warfare, cyber defenses, air defenses, cruise missile defenses. “All that’s really important because we’ve got to make sure the balance doesn't change here, qualitatively or quantitatively, and we’re not going to let that happen,” Carter said. BEIJING, December 17. /TASS/. China launched on Thursday the first national satellite to study the dark matter. The launch was made on Changzheng-2D carrier from the Jiuquan Satellite Launch Centre in Gansu province, Xinhua news agency reported. The Dark Matter Particle Explorer (DAMPE) satellite will enter a sun-synchronous orbit at a height of 500 km to observe the direction, energy and electric charge of high-energy particles in space. For the first two years, the apparatus will study the entire space, and then will focus on the segments, where, as scientists suppose, monitoring the dark matter would be most probable. Dark matter is a hypothetical kind of matter that cannot be seen with telescopes but accounts for most of the matter in the universe. The existence and properties of dark matter are inferred from its gravitational effects on visible matter, on radiation, and on the large-scale structure of the universe. Dark matter has not been detected directly, making it one of the greatest mysteries in modern astrophysics. The new forces include the General Command for the People's Liberation Army (a central command for ground forces), the Rocket Force and the Strategic Support Force. During the ceremony for the new forces in Beijing, Chinese President Xi Jinping passed the flags to the units. "Song said this new force is mainly aimed at providing resources capable of protecting China's cyber and space security," an article on the Chinese Defense Ministry website said. President Xi Jinping also emphasized the new force's adherence to China's current ideological rhetoric of the "Chinese dream." "The creation of the general command, rocket force and strategic support force is very important for the implementation of the Chinese dream about strengthening the army in light of the current situation. This a strategic measure to create a modern military system, taking into consideration the specificity of China," Xi said, as quoted in the statement. According to the statement, the aim of creating new units was to enhance the preparedness of the Chinese army. The People's Liberation Army is the biggest army in the world with a strength of more than two million military personnel. Beijing also possesses nuclear weapons and an aircraft carrier; a second one is under construction. These factors make the Chinese army one of the strongest and best-equipped in the world. China claims to have finished building the world's most powerful ion thruster for space rockets. These new ion thrusters are 10 times more fuel efficient than rocket engines which burn chemicals, according to a mainland media report. They've been doing it since 1970s. China’s largest and most powerful rocket the Long March 5 underwent final tests at the Wen-chang Satellite Launch Center in Hainan province. The rocket's first flight will be conducted in September, according to a senior project manager. The Long March 5 is China’s latest and most technologically advanced rocket. The tests were conducted for more than 130 days of September last year. The Chang'e 5 lunar probe, which will land on the moon and take samples before returning to Earth, also took part in the tests, said Li Dong, a senior designer at the China Academy of Launch Vehicle Technology and head of the Long March 5 project, newspaper China’s Daily reported. Li said the tests were the riskiest and most sophisticated that China has ever conducted on its rockets and involved about 300 engineers. The tests' results will be used to improve the first mass-production rocket, which will be launched in September, he added. The Long March 5 is nearly 57 meters high, with a diameter of 5 m. “It has a liftoff weight of around 800 metric tons; it will have a maximum payload capacity of 25 metric tons in the low Earth orbit and 14 metric tons in geosynchronous transfer orbit roughly comparable to those of the United States' Delta IV and Atlas V,” China Daily wrote. After the Long March 5 becomes operational, it will be used to launch large lunar probes and the manned space station that China plans to send into orbit around 2020. China’s proposed orbital telescope will provide for a field of view 300 times that of Hubble, and will dramatically boost space exploration. According to the English-language edition of the Chinese People's Daily, the People's Republic of China intends to place a new telescope into orbit. The unnamed telescope will be similar to Hubble, but with a field of view as much as 300 times larger. An official announcement was made by Zhang Yulin, Deputy to the National People's Congress and Deputy Minister of Central Military Commission Equipment Development Department. The statement projects that within ten years of orbital observations, the telescope will be able to capture about 40 percent of known space, providing data that help China to "make breakthrough developments on the origin, development, and evolution of the universe". The telescope will be able to dock with the Chinese Tiangong space station (presumably, Tiangong-3, given its modular design) in the event of maintenance or malfunction, allowing astronauts to perform repairs. NASA currently must launch a special mission to Hubble if maintenance is required. Using a space station as a maintenance dock for orbital telescopes is a first for China, and the world. No launch date for the telescope has been named, but it is thought that it will occur after 2020, around the time that the Tiangong-3 space station will be placed into orbit. The space telescope's imaging technology would make it capable of identifying exoplanets and possibly identifying dark matter and dark energy, according to Popular Mechanics. China has launched its 22nd satellite for its BeiDou navigation system in the early hours of Wednesday, local media reported. The U.S.-China Economic and Security Review Commission (USCC) recently released its 2015 annual report to Congress, and it includes an intriguing look at the China's space and counterspace programs. The 2015 report, released in November and provided to Inside Outer Space by the USCC, provides information on and analysis of developments in the U.S.-China security dynamic, U.S.-China bilateral trade and economic relations, and China's evolving bilateral relationships with other nations. "China's aspirations are driven by its assessment that space power enables the country's military modernization and would allow it to challenge U.S. information superiority during a conflict," the report states. Among other purposes, the report contends, China's space and counterspace programs are designed to support its conduct as part of its antiaccess/area denial strategy to prevent or impede U.S. intervention in a potential conflict. The U.S. Department of Defense defines "antiaccess" actions as those that are intended to slow deployment of an adversary's forces into a theater or cause them to operate at distances farther from the conflict than they would prefer. "Area denial" actions affect maneuvers within a theater, and are intended to impede an adversary's operations within areas where friendly forces cannot or will not prevent access. The report is rich in factoids and citations about China's aspirations in space – both for civil and military purposes, including that country's expanding deep-space exploration agenda. Although China's space capabilities still generally lag behind those of the United States and Russia, its space program is expanding and accelerating rapidly as many other nations' programs proceed with dwindling resources and limited goals. China's aspirations in space are driven by its judgment that space power enables the country's military modernization, drives its economic and technological advancements, allows it to challenge U.S. information superiority during a conflict, and provides the Chinese Communist Party with significant domestic legitimacy and international prestige. China likely has capitalized on international cooperation to acquire the bulk of the technology and expertise needed for most of its space programs. China probably will continue to pursue close cooperation with international partners to overcome specific technical challenges and to meet its research and development objectives and launch timelines. As China's developmental counterspace capabilities become operational, China will be able to hold at risk U.S. national security satellites in every orbital regime. China is testing increasingly complex co-orbital proximity capabilities. Although it may not develop or operationally deploy all of these coorbital technologies for counterspace missions, China is setting a strong foundation for future co-orbital antisatellite systems that could include jammers, robotic arms, kinetic kill vehicles, and lasers. Civilian projects, such as China's human spaceflight missions, directly support the development of People's Liberation Army (PLA) space, counterspace, and conventional capabilities. Moreover, Chinese civilian and commercial satellites likely contribute to the PLA's command, control, communications, computers, intelligence, surveillance, and reconnaissance (C4ISR) efforts whenever it is technically and logistically feasible for them to be so utilized, and they would probably be directly subordinate to the PLA during a crisis or conflict. Given the PLA's central role in all of China's space activities, U.S. cooperation with China on space issues could mean supporting the PLA's space and counterspace capabilities. China's rise as a major space power challenges decades of U.S. dominance in space—an arena in which the United States has substantial military, civilian, and commercial interests. Why on Earth Is China Shooting Crude Oil Into Space? On April 6th, China’s SJ-10 satellite launched into orbit from the remote Jiuquan spaceport in the Gobi desert. The event would be unremarkable if not for the satellite’s rather unusual payload: six titanium cylinders of crude oil, compressed to 500 times standard atmospheric pressure. Launching stuff into orbit is expensive, and we don’t exactly need oil in outer space. (Most rockets today run on liquid hydrogen and oxygen.) But China’s not interested in building a fleet of gas-guzzling spacecraft. It’s interested in finding more oil on Earth to support its gas-guzzling cars. And that information is of great interest to Chinese and European oil companies, who hope it’ll lead us to more elusive fossil fuel reserves here on Earth. “Deep underground, crushing pressure and rising temperature as one goes down is thought to lead to a diffusion effect—petroleum compounds moving due to temperature, basically defying gravity,” said Olivier Minster, a scientist with the European Space Agency, which is a partner on the project. I can’t help but feel there’s something terribly dystopian in space agencies being contracted by oil companies to help us discover more of the fossil fuels we’re supposed to be weaning ourselves off of this century. Then again, from a basic research perspective, this sounds like a fascinating experiment. And hey, maybe we’ll learn that deep crustal oil reserves are a lot sparser or harder-to-get-at than we thought. Could wind up being the wakeup call we need to transition over to clean energy. The first launch of the new Chinese carrier rocket "Long March-7" c from the new spaceport Wenchang. It appears that the Tiangong 1 mission had ended unexpectedly due to a dysfunctional battery charger, a source close to the Chinese space industry disclosed. While all eyes are now fixed on the recently launched Tiangong 2 space laboratory module and the upcoming expedition missions, its predecessor Tiangong 1 is on an uncontrolled course to come crashing down to Earth in late 2017. The Tiangong 1 space module was intended to serve as a ‘target vehicle’ for perfecting the orbital rendezvous docking technique. Since its launch in September 2011, a total of three expedition missions (one unmanned and two manned) have performed rendezvous dockings, in both automatic and manual mode, with the space module. The designed operational lifespan of the space module is two years. According to the original mission description document published by the China Manned Space Agency (CMSA), at the end of its mission the Tiangong 1 module would perform a controlled destructive re-entry into the South Pacific Ocean. The mission description document did not give an exact date for the space module’s controlled re-entry. After the ending of the last expedition mission Shenzhou 10 in June 2013, the space module was put into a sleep mode to continue flying in orbit to allow the ground control to collect data on the longevity of its key components. On 21 March 2016, the China Manned Space Agency (CMSA) announced that the ground mission control had lost all telemetry and communications with Tiangong 1, leaving no ability to safely control its descent. By then, the space module had been flying in orbit for 1,630 days since its launch, or 2 years and 9 months since the ending of its final expedition mission. During the press conference for the Tiangong 2 launch on 14 September 2016, the spokeswoman of the CMSA, Wu Ping, confirmed that Tiangong 1 was intact and operating on a 370 km orbit, with an orbital depletion rate of about 100 m daily. The space module is expected to burn up during an uncontrolled atmospheric re-entry sometime in late 2017. Although the CMSA did not give a reason for the abrupt ending of the Tiangong 1 mission, it is understood that the mission had ended unexpectedly due to a dysfunctional battery charger, leaving the space module unable to recharge its batteries from its solar panels. Tiangong 1 has two four-panel solar wings attached to its service compartment, each about 3.1 m x 10 m in size. These can be rotated to obtain maximum solar insolation regardless of spacecraft attitude. Sun sensors between the panels measure the sunlight incidence angle which allows the panels to be automatically commanded to an optimum angle. The space module also carries a number of silver-zinc batteries in its service module, which can provide emergency power for about 6 hours in case of failure of the solar arrays. However, without a functioning batter charger to recharge, these batteries eventually ran out. Without power supply, the space module lost all communications and telemetry transmissions with the earth, so the ground control could no longer to command the space module for a controlled re-entry. Despite some concerns, the majority of the Tiangong 1 module would burn up during the atmospheric re-entry, though It is probable that some large pieces will survive re-entry and hit the Earth’s surface. While it is impossible to accurately predict the time and location of the re-entry, the likelihood of this taking place over a populated area is minimal. China launched the Shenzhou 11 spacecraft with a crew of two astronauts in the morning on Monday 17 October, three years since the country’s last human spaceflight mission. The first launch of Chinese heavy carrier rocket "Long March-5"
Chinese astronauts Jing Haipeng and Chen Dong, who performed the country's longest-ever manned space mission that lasted more than a month on board of the Tiangong-2 space laboratory, returned safely to Earth on Friday, media reported. BEIJING, April 20. /TASS/. The first Chinese cargo spacecraft Tianzhou-1 (Heavenly Vessel-1) was launched from the Wenchang spaceport in the southern Hainan province by a Chang Zheng-7 (Long-March-7) carrier rocket on Thursday. The launch was broadcast live by China’s central television. 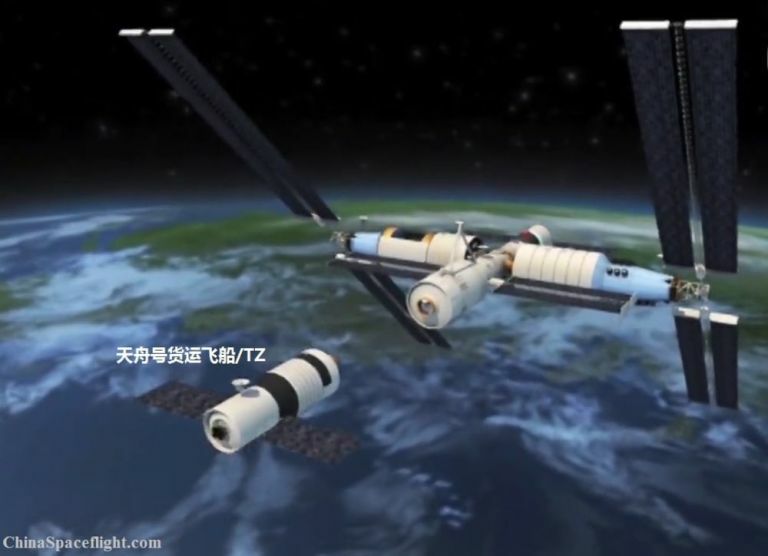 The cargo ship is intended to dock with the Tiangon-2 orbital space station and conduct the station’s on-orbit refueling. The Chang Zheng-7 is a new-generation carrier rocket to deliver satellites weighing up to 13.5 tonnes into near-Earth orbit. It was launched for the first time in June last year from the Wenchang space center, marking a new stage in China’s space exploration. BEIJING, April 28. /TASS/. China plans to begin the construction of its own orbital station in 2019, Wang Zhaoyao, the director of China's Manned Space Program Office, said on Friday. "We completed a period of trials of a space lab and are now beginning the construction of an orbital station," he said. "In line with our plans, the construction of the station will be underway in the period between 2019 and 2022, with a huge number of [space] launches scheduled during this period." "When the construction is over, the station will be constantly inhabited by astronauts. It would be regretful if such an opportunity is wasted," he said.